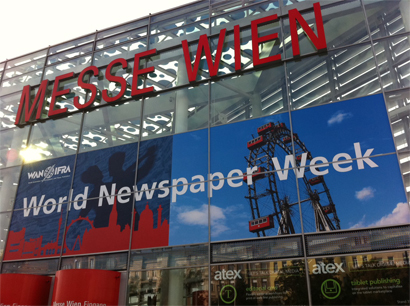 Opening the World Editors Forum in Vienna today, Dr Hans Gasser, president of Austrian Newspaper Association, paid tribute to the country’s newspaper market, calling on journalists to meet industry challenges with innovation. This global summit meeting of publishers, CEOs and editors-in-chief in dialogue with distinguished experts of our industry is embedded in highly exciting times. The agenda of the three days is characterised by the power of innovation, by the energy with which our industry faces up to the challenges, using the opportunities to transfer its core competances to use cross media offerings … to accomodate media users in their changed consumption behaviours. He added that following the crisis on financial markets the journalists’ democratic function “is as important as ever”. We need to increasingly focus on our quality-based strengths, using quality journalism on all platforms to offer people visible added value because only then will they be prepared to invest their time and money. Closing with reference to Austria’s own market, Dr Gasser defined it as “extremely competitive” and despite its relatively small size “very innovative”. By international standards we have high reaches and circulation numbers continue to be stable due to a high amount of subscriptions with a very strong regional focus and boasting a print market share of 55.6 per cent in advertisng and this depsite the ever increasing competition. This is why the small country of Autria is one of the big newspaper and magazine countries of this world. This entry was posted in Events, Journalism and tagged #wef11, Austria, Dr Hans Gasser, WAN-IFRA, world editors forum on October 13, 2011 by Rachel Bartlett.